Everyone needs a little more power in their lives. 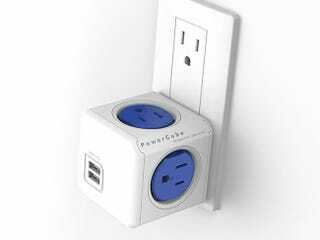 As opposed to most bulky power strips, the Powercube offers a simple, socket-multiplying solution (including USB ports). Lifehacker readers can grab one for 10% off. Unlike many splitters, the PowerCube has been designed neatly to ensure the newly created sockets don't get in the way of each other. As you might hope, the 'Cube is ETL and cETL certified, and it has a neat resettable 15 amp fuse to keep your electricals in good health. It is also expandable, with plug-in extra sockets and USB ports available separately. It's not bad looking, either, with both blue and gray versions on offer.